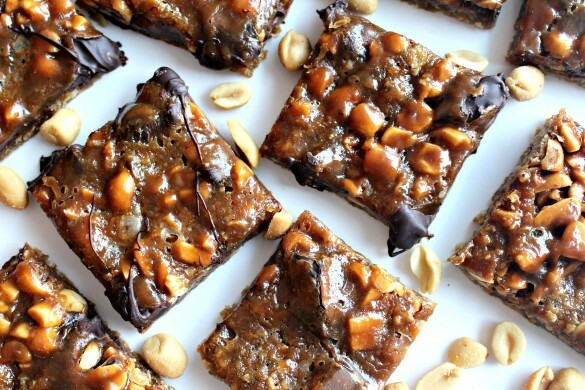 If you are the motivated type who eats nothing but salad in January, I suggest you pin these Caramel Chocolate Peanut Bars for February. For the rest of us, wait out the snow storms with something delicious in hand. 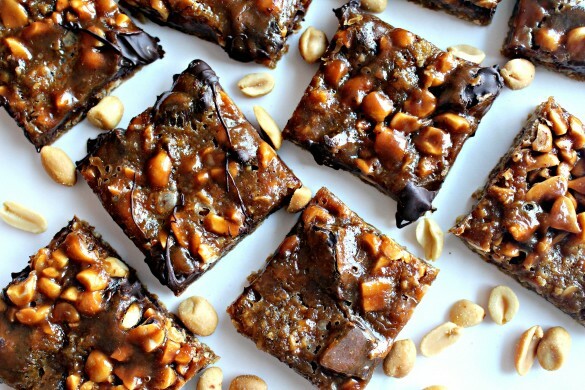 Caramel Chocolate Peanut Bars are just the kind of chewy, gooey comfort food this crazy weather calls for. Here in St. Louis, we only had a few inches of snow which are currently melting, turning the Midwest into a giant mud puddle. Though my Sheltie, Pax, finds mud wrestling the optimal dog park activity, I find it a mess. Luckily, we have a hand-held shower head which is very convenient for removing the daily accumulation of mudscicles from his belly. If only I could train Pax to do his own dog towel laundry! My preferred location for waiting out winter in general, is sitting in front of the fireplace, fire crackling, with a good book in my hands. These days, most of the books I have piled up for perusing are cookbooks. Specifically, baking books. Which probably is no surprise. Some of the cookbooks really do read like novels, just with recipes inserted into the storyline. Sometimes it’s the author’s tales that draw me in. Other times, it’s the photographs. In the case of Rose Levy Beranbaum, it is often both. 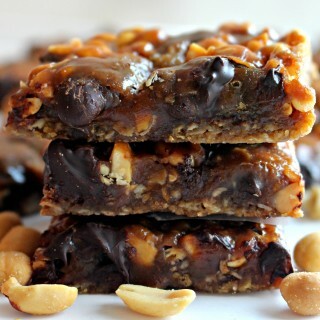 I was recently flipping through one of her out of print cookbooks, Rose’s Christmas Cookies, when a picture of bar cookies covered in nuts and chunks of chocolate, glistening with caramel, made it impossible to turn the page. 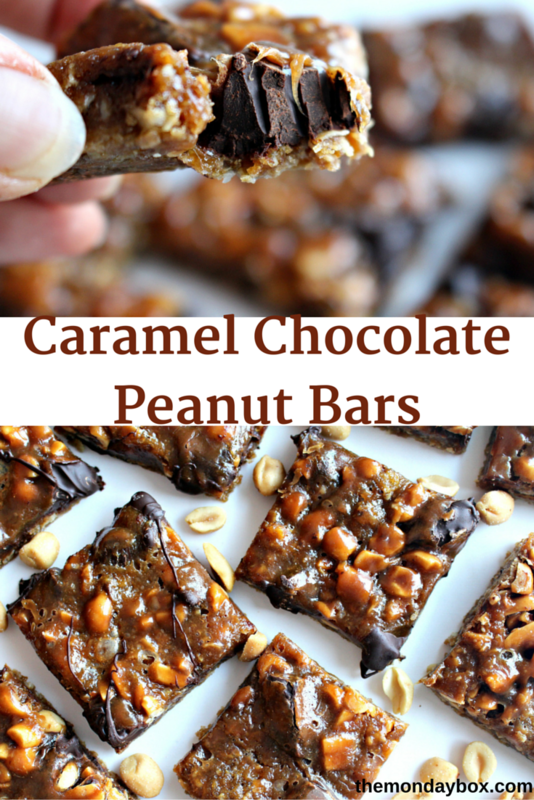 These Caramel Chocolate Peanut Bars went to the top of my baking list. This was one of those recipes that left me puzzled. 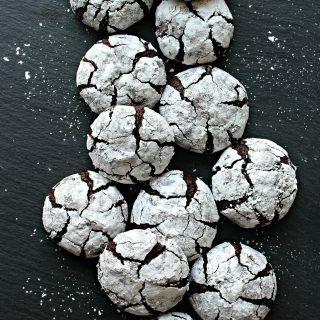 When I make something from a cookbook from a talented and knowledgeable baker, and it doesn’t turn out as expected, I automatically assume that I did something wrong. Did I leave out an ingredient? Mismeasure? Not follow the method properly? The cookbook photos of these bars had me hooked. So I baked again, being super diligent. Again, the results did not make me happy. I did eventually get to happy, but it took some recipe tweaking. The original recipe calls for 12 tablespoons of butter in the cookie base. 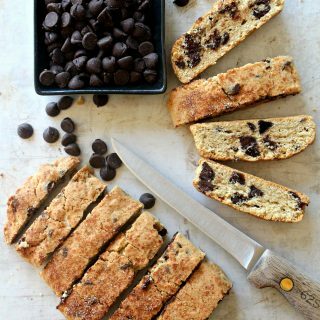 After baking, the recipe indicates that the overly buttery bars should be allowed to sit on paper towels to drain off the excess. Maybe there is a complex chemical reaction involved in using too much butter, then draining it out? Tweak one was to reduce the butter. I worried that maybe that would affect the texture of the base. Instead, the resulting cookie base is tender and buttery, without being greasy. Rather than using a greased pan, which only added to the problem, I found that lining the baking pan with parchment paper kept the bars from sticking and provided handles which were very helpful for lifting out of the pan onto the cutting board after baking. Being a self-taught baker, I never knew there was a trick to lining a baking pan. I always used two overlapping sheets of parchment. Take a look at Cindy’s video to learn how to line your baking pans like a pro! Tweak two was only a matter of adjusting expectations. The original recipe claims to stay fresh for up to three weeks. I was excited that I had found a recipe that might work for my slow traveling Navy care packages. Not so. 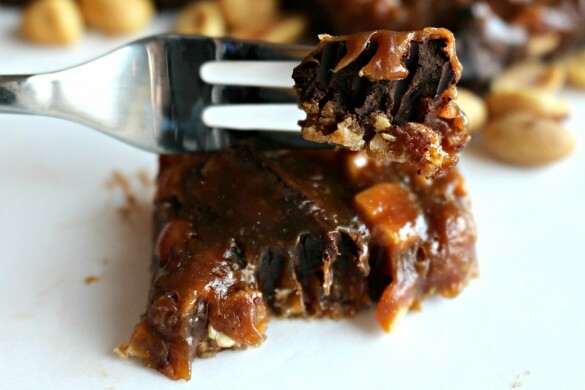 Caramel Chocolate Peanut Bars are amazingly melty, and gooey for a day. The bars continue to be deliciously ultra-chewy for two or three days. For up to a week, the flavors and chew still entice and delight. After that, I was not impressed. 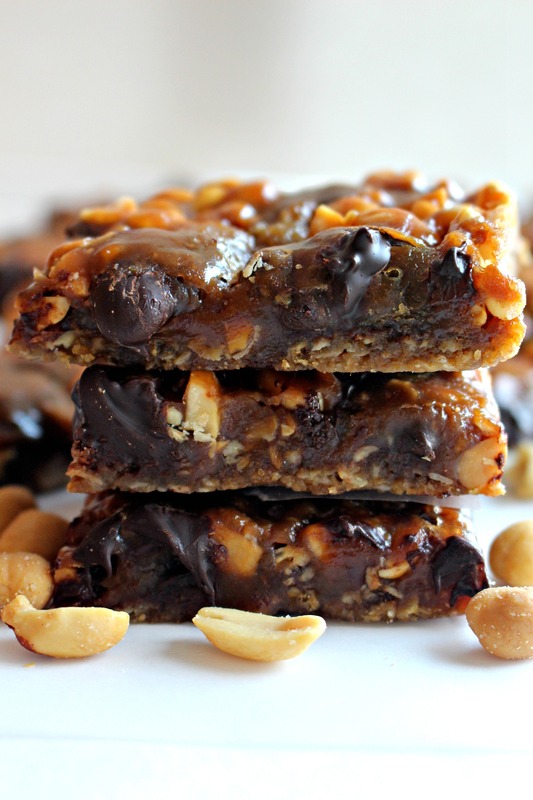 Caramel Chocolate Peanut Bars are chewy, comfort treats. Stored at room temperature in an airtight container, in layers separated with wax paper, these bars satisfy a sweet tooth and sooth the soul for up to one week. Just what we need in this crazy weather! In a medium saucepan, over medium-low heat, stir constantly to combine sugar and corn syrup until boiling (about 3 minutes). Without stirring, allow the mixture to boil for about 5 minutes until deep amber (370° F on a candy thermometer). Remove the pan from the heat and mix in the butter. Gradually mix in the cream. Return the saucepan to the stove and, stirring constantly, boil on medium-high heat for about 1 ½ minutes (240°F on a candy thermometer). Pour the caramel sauce into a 2 cup measuring cup. Allow to cool for 10 minutes, then mix in the vanilla. Preheat the oven to 350° F. Line a 9” x 13” metal baking pan with parchment paper. Allow for some overhang for easy lifting after baking. In the bowl of an electric mixer, combine the flour, oats, brown sugar, baking soda, salt, and melted butter. Press the dough evenly over the bottom of the prepared pan. The base will be thin. A sheet of wax paper over the dough helps to distribute. Bake for 10 minutes then remove from the oven. Sprinkle the chopped chocolate and peanuts over the base. 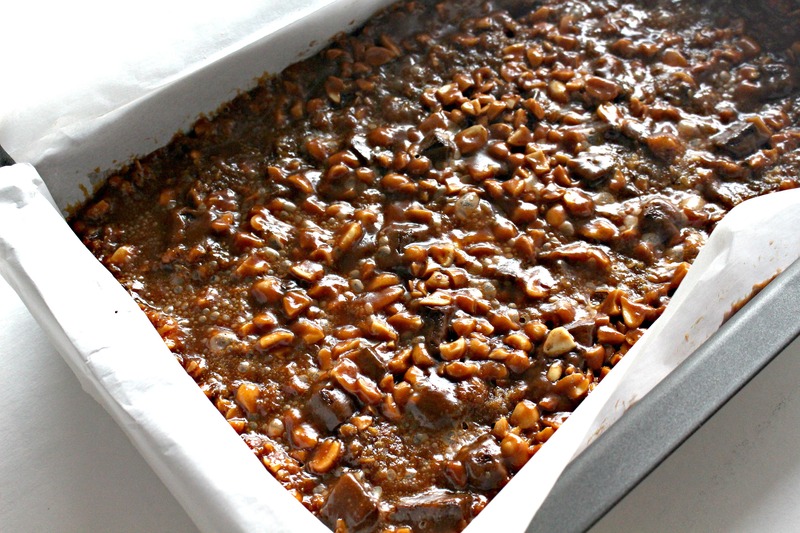 Return to the oven for 15-20 minutes or until the caramel is bubbling. Cool the chews completely in the pan. When ready to cut, lift out of the pan using the parchment overhang, and slice into bars on a cutting board. These chews should only be shipped in cool weather. Wrap two bars, bottoms together, in a strip of wax paper, then wrap in plastic wrap. Place a column of wrapped bundles in a freezer weight ziplock bag or airtight container. 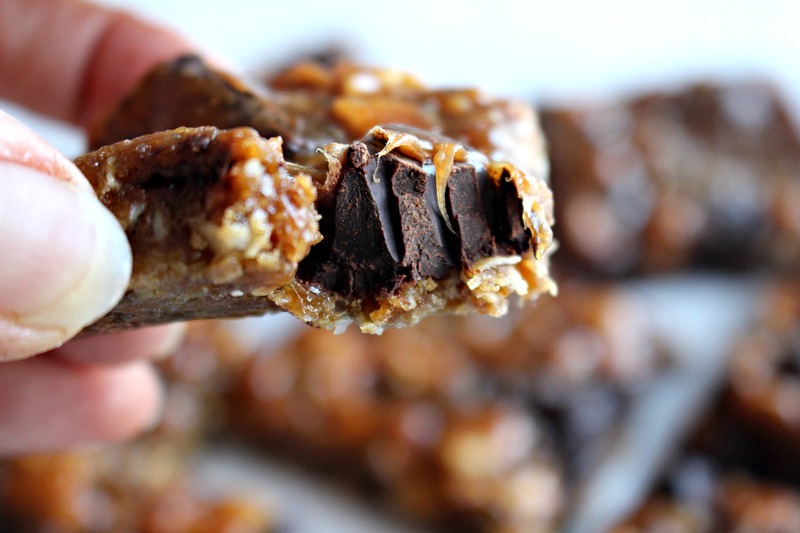 These bars look outrageously good Wendy! 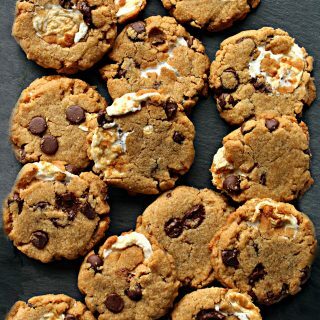 This is crazy weather and these would be the perfect treat after shoveling snow! I don’t think they will last a week however 🙂 Have a lovely week! Caramel anything is my weakness. These must be amazing with the salty peanuts. So surprising to hear that the recipe as written wasn’t perfect. 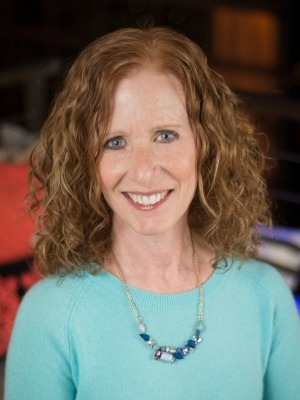 The fact that Rose Levy Beranbaum can make mistakes makes me love her even more! Even though I don’t really love dogs, sometimes I wish I had one so i would be forced to go outside in the winter and walk. Then I would feel less guilty about eating these! Until recently, I didn’t know that I had a weakness for caramel. Then I made my first batch of homemade caramel sauce. Whoa! Baking is like opening Pandoras Box. There are more and more things that I now have a weakness for. Too bad none of those things involves exercise! Oh Wendy, these look wonderful. I’m so happy you tweaked the recipe to perfection! Thank you for doing all that experimenting so we can have these scrumptious bars! The method does sound odd. My favorite place this time of the year is in front of a fire too. Hopefully with a sweet treat in hand like this! 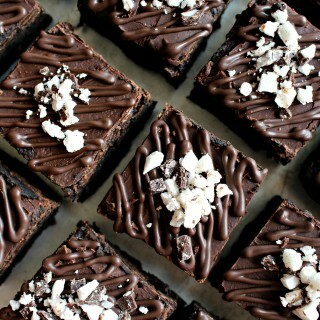 They look quite delicious! Everything about these bars are amazing! 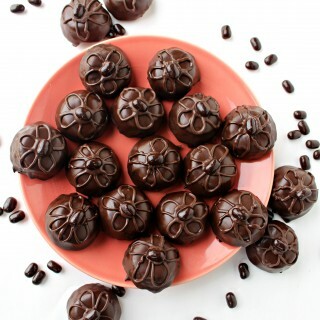 Gorgeous pics, too – and they’ve really set off a craving! Thanks for sharing with us at Throwback Thursday! Thanks, Mollie! Besides the flavor,I love the chewiness of these bars! Photos are something I am working hard to improve, so your compliment means a lot! Thank you. 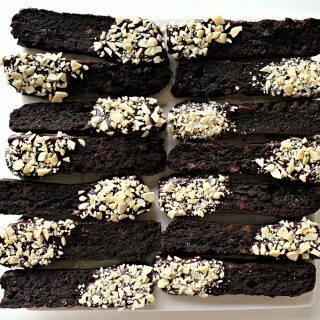 Who could resist these amazing bars, yum!! Thanks so much for sharing with Full Plate Thursday today. Have a great day and come back soon! Thank YOU, Miz Helen for hosting and for your kind words! I love chewy bars like these!